Testing a hot new special like the FireBlade-engined Harris Magnum 5 probably sounds like a pretty enjoyable way to earn a living, and most of the time it is. But not right now. Right now we need cornering pictures, so I'm cranking the Magnum repeatedly round a big figure-of-eight roundabout. Once every lap Goldman's flash-gun fires a bolt of light through the dull December day, just as the sound of knee-scraper drowns out the burble from the twin silencers in the tailpiece. Great fun. Except that twice every lap I'm lifting my left hand from the bar to wipe a thin film of water from my visor. Basically, I'm bricking it. If we're going to get any decent pics I can't afford to slow down, but binning the only Magnum 5 in existence on the increasingly not-quite dry road is not an option especially as Harris haven't even finished taking all their frame-jig measurements from this prototype. If ever I needed a fine-handling, neutral-steering bike with heaps of grip it's now. Thankfully the Magnum and its Metzeler MEZ1s were up to the job, doubtless saving me from death by a thousand Snap-On blows on return to the Harris headquarters in Hertford. And in a way, the need to ride hard in bad conditions showed the Magnum at its best, because if ever there's been a special built not just for all-out speed but for stability and sure-footed handling too, it's this one. Like its predecessors stretching all the way back to the Magnum 1 in the late '70s, the Magnum 5 is an aggressive, hand-built caf-racer. This bike is the most stylish of the lot, with a neat twin-headlamp fairing, lashings of carbon-fibre and a 916-style high-level exhaust system. Traditionally, if you put a Magnum alongside the Jap four whose engine it used, one bike would also have a tricker frame, steeper steering geometry, shorter wheelbase and racier riding position. In the Magnum 5's case, that's still true but it's the standard FireBlade that's the more radical bike in each respect. Harris are no slouches at building alloy-framed race-replicas, as many previous specials and their works YZR500-engined Grand Prix racebike prove. 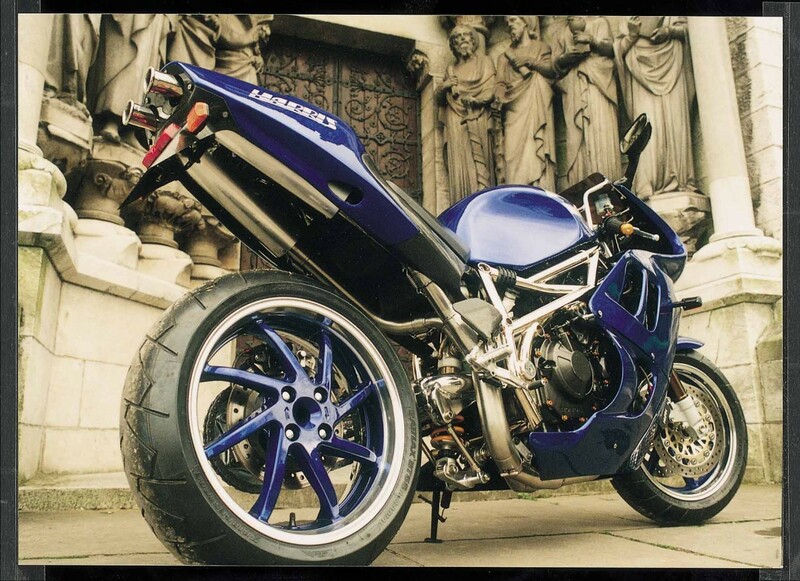 But this Magnum, like its predecessors, relies on steel in this case, 35mm diameter cold drawn steel tubes arranged in very similar fashion to those of the Suzuki GSX-R engined Magnum 4. And rather than attempt to make the 'Blade's razor-edge handling sharper still, Harris have opted to retain the 4's slightly less radical steering geometry. This Magnum's forks are raked at 25 degrees, compared to the standard CBR's 24, and its wheelbase is 45mm longer at 1450mm. The Harris bike's seat is 20mm lower than the current Honda's, too, giving a slightly less racy riding position more like that of the 1996-model FireBlade. Numerous carbon-fibre parts, including the self-supporting seat unit (the rear section, like most of the fairing, is glass-fibre), mean that the Magnum's weight is almost identical to the 185kg of the standard Honda. The Harris intention with this bike was that as many standard components as possible should be used, so parts including forks and yokes, wheels and brakes, clocks and switchgear are all CBR items. That helped give a very familiar feel as I fired up the Magnum and headed off for the first time. So too did the fuel tank which, although made from aluminium instead of the standard steel, was just as wide (partly because it has to enclose the airbox) and forced my legs out in traditional FireBlade fashion. At least the solid-mounted, tucked-in footpegs were an improvement on the originals. This prototype's motor was bog-standard, and Harris hadn't even had the chance to set-up the carburation after fitting their neat and very quiet-sounding four-into-one-into-two exhaust. The Magnum ran fine, though, maybe feeling a little fluffier than normal below 4000rpm, but stonking off with typical FireBlade ferocity once the tacho got above six grand. Cruising at 120mph was licence-losingly easy, and with my head behind the tinted screen the Honda was still pulling with over 150mph on the clock. If the pipe can add a few horses, it could be enough to make an old engine outdrag the 918cc '96 model. With a fraction more rake and a longer wheelbase you'd expect the Magnum to take marginally more effort to get round bends, and that's just how it felt. Riding home on the cold but dry afternoon that I picked the bike up, I initially ran slightly wide exiting a couple of roundabouts before readjusting to use a little more muscle on the bars. Next day I didn't even notice it the Magnum felt superbly neutral, and quick-steering enough to be flicked very rapidly through a tight series of bends. Stability was excellent, too, the Harris notably keeping its head on one particularly fast and bumpy Midlands B-road that might well have got a standard 'Blade in a bit of a flap at the same speed. Good as the standard shock is, there's something about a well set-up …hlins unit that seems to dismiss minor bumps while giving almost perfect feedback. Forks, brakes and the Metzelers were pretty flawless, too a far cry from the early Magnum days, when 38mm Marzocchis, twin-pot Lockheeds and Pirelli Phantoms were about as good as it got. If the Magnum 5's greatest asset is its speed, in a way the most impressive thing about this bike is the one that was the biggest drawback of its predecessors in the '80s: the price. 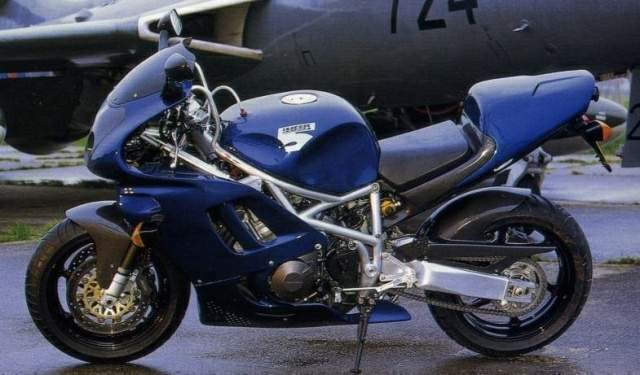 Ten or fifteen years ago, owning a Harris meant spending 50 per cent more than the cost of a big Japanese superbike. In contrast the basic Magnum 5 kit costs about £4500 including VAT, and the availability of FireBlade engines and high-quality original parts means you could assemble a HarriBlade for roughly the cost of a new 900RR. The increase in performance is nowhere near as great, of course. In fact FireBlade riders who don't mind the odd handlebar twitch might well consider the Magnum's slight gain in stability at the expense of agility a retrograde step. But while I'm not convinced that the Harris would be the faster bike on most roads, there's no doubting that this is a fine-handling and blindingly quick motorbike as well as a handsome and exotic one. Given a straight choice between special and stocker, the Magnum 5 looks mighty tempting to me. "The FireBlade is a nice bike but its steering is a bit nervous, a bit twitchy," says Lester Harris. "We didn't want to radically alter it, we wanted to take a FireBlade, keep the good points and improve the bad areas. "We've altered the riding position. You're a bit over the handlebars on the standard bike, so we've moved the rider back and down a bit. We've extended the wheelbase marginally, raked the forks out a touch and the result is a similar quick-steering bike that is a bit more comfortable to ride and a bit more sure-footed on the front. "You could say the Magnum's steering is slower but remember this is not a racing bike, it's a road bike. Our opinion is that for most people the FireBlade is a bit extreme, so we've tried to calm it down a bit, make it a little more user-friendly without losing the manoeuvrability." "The blokes we're aiming at are FireBlade riders who've crashed and wrecked their bikes, destroyed the frame and tank and bodywork," says Harris's Neil Procter-Blain, who had a big hand in developing the Magnum. "Someone in that position could buy a kit for less than it would cost to rebuild the standard bike. "Because so many 'Blades have been crashed, there are plenty in the breakers. And because the Magnum uses so many standard Honda parts, people can just go to a breaker and buy them even the little bits like the coils and sidestand are standard. You could strip a crashed 'Blade and bolt the good bits straight onto the Magnum as you go." By no means all the Magnums will be sold in this country. The bike has already been TuV approved, and Harris's German importer has several bikes on order including one with twin spots and no fairing. Cost of the basic Magnum 5 kit is £3850 plus VAT. For that you get the frame, swing-arm, alloy fuel tank, …hlins shock, carbon seat unit, footrest kits and engine plates. You don't get the fairing, which will cost about £350 in fibreglass or £550 in carbon, or the stainless steel exhaust system, which will be about £750. Most important Honda bit you'll need is the engine. These are cheaper than you might think. 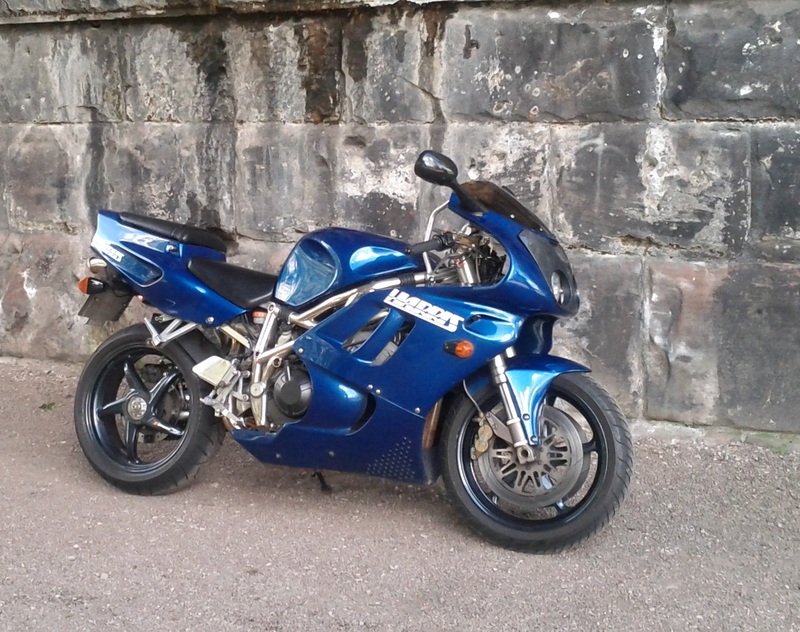 So many FireBlades get dumped and badly damaged or written-off that breaking specialists Just Blades of Coxhoe, Co Durham (0191 377 1277) sell used motors for between £800 (early model) to £1250, for the Foxeye CBR lump with magnesium cam-cover and reworked gearchange. Just Blades boss Derek Baillie says he'll uncrate a brand new motor for £1500. His rough prices for other bits are fork and yoke assembly £350, front and rear wheels £100 each, discs £50 each, radiator £150, clocks £125. So even after allowing extra for tyres, mudguards, headlights, handlebars and switches, wiring loom, carbs, other bits and bobs plus the obligatory flash paint-job, you won't be a million miles off the price of a bog-stock CBR900RR, provided you bolt the Magnum together yourself. The original Harris Magnum was a road-legal version of Steve and Lester Harris's Z1000-engined racebike of the late '70s. "The first bikes were just endurance racers on the road but then we made a proper road bike, the first Magnum, with a road fairing and fibreglass tank cover," recalls Lester. A 1981 restyle by Target Design (creators of Suzuki's Katana) produced the Magnum 2, generally powered by Suzuki's GSX1100. "That was by far the most popular Magnum. We've probably sold about 800 and still get the odd order even now." The mid-'80s Magnum 3, initially for Kawasaki's GPz1100, had a frame made from a mix of steel tube and aluminium plate, plus rising-rate suspension, 16-inch wheels and radical geometry compared to Japanese roadsters. "It handled really well but wasn't great to look at, and never sold particularly well," says Lester. "We remembered that lesson when we built a bike for Suzuki's GSX-R motors a few years ago. The Magnum 4 had a steel frame with the geometry of our alloy-framed endurance racer, and we made sure it was styled right too."